A complete boat can be yours, just put a group together and you are among your friends and the only one on a traditional wooden Gullet. Such a trip is also a good idea for clubs and other parties. From 10 persons onward we reserve a boat for you and suggest the best itinerary. This is the cabin charter for those who are after something a little more special and a little more upmarket. Our First Class Cabin Charters offer guests an air-conditioned vessel (during July and August) of superior quality. On board service is of a high standard and the yacht is equipped for both relaxation and leisure activities. We are proud to operate the only cabin charter program on the Aegean visiting the Cyclades islands (Mykonos, Naxos, Paros, Ios, Santorini, Amorgos) and Dodecanese (Levita, Leros, Kos) islands plus the world famous resort town of Turkey, Bodrum. You can also combine this sailing program with an amazing discovery of Turkey and mainland of Greece. The beautiful Cyclades Islands, the island of Mykonos and the surrounding islands, and the impressive Dodecanese islands are on the mouth of the Aegean open sea, the weather conditions can occasionally become unpredictable, to choppy seas and high winds. In the case that captain of the boat believes it is safer to change the planned itinerary of the tour, an alternative route will be followed. This may result in landing on different islands than presented on the sample tour itinerary or remaining on the same island until the weather conditions allow us to continue further. Therefore please consider the itinerary as a sample route which may be changed depending on the weather conditions. updated for 2012. All our prices are based on Euro, all other currencies are only valid as a guideline, and refer to the currency rate of April 3, 2012. First line: the price is for one person sharing a double cabin. All cabins have en-suite WC/shower. Single passengers (blue writing) who wish to have a cabin for themselfes must pay the single occupancy price. Pls don't bring drinks on board. Drinks and tipps are extra. The Cyclades islands, Greece are composed of 39 islands of which 24 are inhabited. The Cyclades are the most famous of all Greek islands with Amorgos, Anafi, Andros, Antiparos, Delos, Ios, Kea, Kimolos, Folegandros, Milos, Mykonos, Naxos, Paros, Santorini, Serifos, Sikinos, Sifnos, Syros and Tinos. A Blue Cruise may combine a visit to Mykonos, Naxos, Paros and some other smaller islands. Welcome to Bodrum, Turkey! Jump on board to meet your captain, crew and fellow travellers. After meeting with your tour leader in the afternoon, you may start to explore the famous night life of Bodrum with your new travel mates. Bodrum is the centre of night life in the Aegean region of Turkey and known for its amazing beaches and gullet cruise trips. History of Bodrum dates back to the 12th century B.C. The city was named 'Halicarnassus', which was the birthplace of Herodotus; the 'Father of History' who lived in the 5th century B.C. The 'Mausoleum' of King Mausolus (350 B.C.) which is one of the Seven Wonders of the World is located in Bodrum. That's the only structure that survived from the Classical Era is the Amphitheatre. It is one of the oldest theatres in Anatolia with a capacity of 13.000 people, and is still hosting many shows and concerts for the art-lovers of Bodrum. Another place that you should visit whilst in Bodrum is the landmark of the city 'Castle of Saint Peter'. It is one of the best preserved pieces of architecture with a history that dates back to the Middle Ages. 'Myndos Gate' through which Alexander the Great entered Halicarnassus is another place that you should not miss. 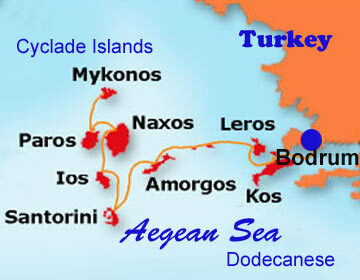 This morning we will cruise to Kos (Cos), the birth place of Hippocrates, 'the Father of Medical Sciences'. Kos is the second largest island of the 12 Dodecanese islands and has a very mild climate and very fertile lands. The island houses a 560-year-old tree, a 211-year-old fountain and a 290 km long beach. You may take a swim in Lambi Beach which is very close to Kos Harbour. In the afternoon we'll cruise to Leros. Leros is a mountainous, green island with high cliffs and many small bays and villages. After a swimming break in Xerakampos, we will anchor at Lakki Harbour or Agia Marina Port located in east. It's worth to visit Platanos, the main city of Leros with steep stairs, narrow streets, and flower gardens. From Platanos you can take the steps leading up the Castle of Leros climbing 300 steps! Rent a bike or explore this island by foot; both options will be unique experiences in this beautiful Dodecanese islands. Even if you are not on your honey moon. The most romantic venue for a romantic honeymoon is no doubt the stunning island of Santorini in the Aegean Sea of Greece. In fact, Santorini consists of several islands which reflects its volcanic origin. Aspro, Thirasia and Thira (the largest islet) make up the ancient caldera cliffs of the earlier volcano. Moreover, two islets have recently form in the middle of the flooded caldera representing the present-day active volcano of Santorini. In the vicinity of the Santorini - Thira are a group of the most beautiful islands of the Cyclades, notably Paros, Naxos, Mykonos - Delos, Milos and Folegandros. All these islands can be visited by private yachts or this tour, since ferries will only arrive at the major commercial ports. Today we depart Ios for Naxos. The island of Naxos is the largest and most central island in the Cyclades. Approaching the island by boat, you can see two small islands to the left and right of the harbour, one with the little church of Myrtidiotissa, and the other called Palatia which is linked to Naxos Town. The imposing gate, Portara is an ancient marble temple dedicated to Apollo. Ligdamis ordered this to be built in the god's honour in the 6th century B.C After the orientation walk in this impressive island you will have more free time to explore the town and to swim in the warm waters of the Aegean Sea – with an optional excursion. Departing from Naxos in the small hours of the morning we head for Paros. The first thing you notice when in Paros is the blue transparent sky floating inside dazzling white sunlight. Look on the island for the white Cycladic houses built next to the Aegean Sea. The two large natural bays of the islands Parikia and Naoussa, have beautifully protected sandy beaches. After a break in Paros we will sail to Mykonos; it is no coincidence that this, the most cosmopolitan of all Greek islands, attracts so many visitors from the entire globe. Here the steep mountains to be encountered in most of the Cyclades islands give way to low, rocky hills which combine with superb beaches. The capital Hora, with its colourful harbour in which little fishing boats nest happily side by side with luxury yachts, presents quite a different picture from that of the majority of Aegean island towns. Mykonos is spread out over a flat area, and the whitewashed streets stand as brilliant white cubic houses with stepped walls for sitting on.